Application: The MS1 Series discs are widely used for machining steel and cast iron. These discs are made of five raw materials: the abrasive mineral and its bonding, the fiberglass reinforced net, the nut and the label. 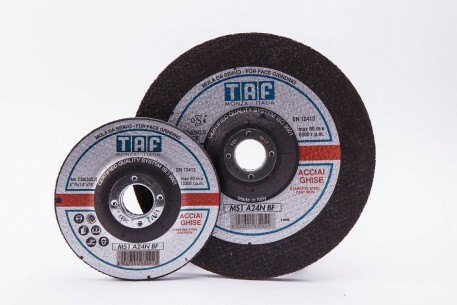 In use the abrasive mineral is the sole "working" raw material of the tool during cutting and grinding operations. The resistance to mechanical stress and the strength of the tool structure is then given by the other mentioned raw materials. The working speed is the most important factor to achieve optimum cutting and or grinding performances.